The problems of raw material supply, transportation, and production planning, discussed in previous chapters, had become urgent before Pearl Harbor, Our labor reserves, however, were so ample that no acute problems of labor supply appeared until later. Shortages of unskilled and industrial workers did not become acute until 1943, and then only in a few production areas. At no time were labor shortages so critical as the shortages of raw materials, machine tools, components, ships, freight cars, and other items which necessitated tight control programs in those fields. These facts account in part for the relative slowness in the development of a national manpower agency, the limited authority granted to this agency, and its relatively slight influence on the labor market. The year 1942 was a period of discussion and tentative experiment. Officials concerned with manpower were shadowboxing with a problem which had not yet developed. There was a great output of plans and much controversy over what should be done and who should do it, but few actions of any importance were taken. Yet this lack of action did not appreciably retard war production. Workers continued to show up at the factories, employers continued to hire and train them, and Government for the most part observed the process from the sidelines. on the large reserve of women not in the labor force; indeed, the number of women in the labor force in December 1941 was substantially less than it had been a year before. nor had there been any net transference of labor out of agriculture, trade, service, and other industries which were relatively overmanned at this time. Hours had not been lengthened beyond 40 except in shipbuilding, machine-tool production, and a few other key industries. In short, there were still in December 1941 extensive labor reserves which could be drawn on to meet increasing labor requirements. Chart 20. The Labor Force. the NDAC, OPM, WPB, and finally under the War Manpower Commission. The outbreak of war caused a sharp increase in the prospective manpower requirements of war industry and the armed services. 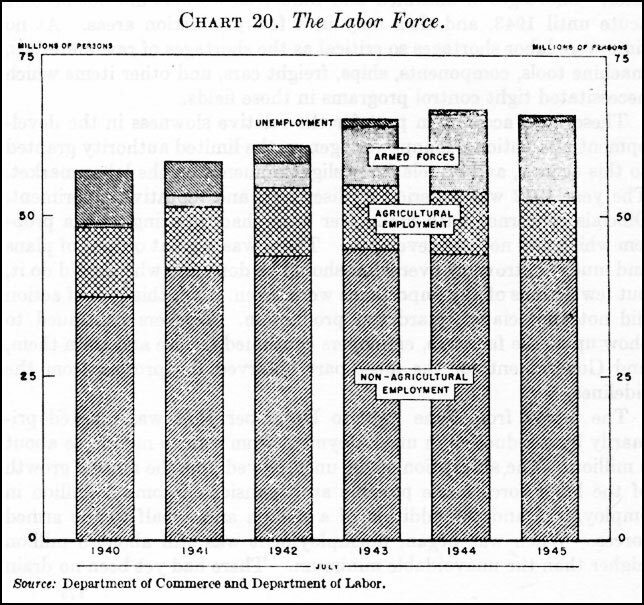 Estimates prepared in the spring of 19421 indicated that the number employed and in the services would have to be increased from the 51.6 million of December 1941 to 60.3 million in December 1943.2 To meet these requirements there were available the various types of labor reserve noted above, and it did not appear that there would be a deficiency in aggregate labor supply. The problem was rather that, because of the concentration of production facilities in certain areas, the geographical distribution of labor requirements differed considerably from the distribution of the labor force. Labor supplies could be matched with demand only through large-scale migration of labor which had been under way since 1940 and was still continuing. The influx of workers into centers of war industry resulted in serious congestion of housing, transportation, and other community services. By early 1942, some areas had already reached the point at which it was not physically possible to absorb more workers in spite of mounting labor demands. In these areas there was a problem of recruiting as many people as possible for war work, directing them to the most essential jobs, and preventing unnecessary shifts of workers form one plant to another. The problem was not sufficiently acute, however, to arouse serious concern among production and procurement officials. Facilities and materials were the important production bottlenecks. While it was conceded that labor might become a problem at some point, the time seemed remote and meanwhile there were other things to do. Nor was industry seriously concerned about its ability to hire enough workers. While employers in many cities formed agreements not to pirate labor from each other and welcomed Government approval of such agreements, they did not favor any governmental restrictions on management's traditional right to hire and fire. Planning for a national manpower agency went forward in an atmosphere charged with the feeling that there probably was no problem of labor supply, and that even if such a problem existed, employers could handle it by their own efforts with perhaps some assistance from organized labor. A more immediate problem during 1942 was the prevention of strikes in war industries. Action to this end was taken immediately on the outbreak of war. A conference of representative leaders of labor and management prepared the way for the creation, early in January 1942, of a National War Labor Board with authority to arbitrate unsettled disputes in industries affecting war production. By the end of 1942 the administrative organization and main policies of the Board had settled into a pattern which was to remain substantially unchanged throughout the war. This development will be traced after a discussion of the steps taken to deal with the problems of labor supply. The creation of the War Manpower Commission in April 1942 must be viewed against the background of previous organization in this field. A dozen major federal agencies and many others of lesser importance had been concerned with labor supply problems since the beginning of the defense program. The Selective Service System, created by act of Congress on September 16, 1940,3 was responsible for inducting men of the number and types required by the armed services.4 Through its network of some 6,500 local boards, it had by December 7, 1941, registered 17 million men aged 21 to 35 and inducted more than a million of these (chart 21). During the next year the number of registrants was to increase to almost 30 million men aged 18 to 45, and the number inducted to more than 5 million. By December 1941 the selection system and administrative procedures of Selective Service had become well established. The early creation of a military manpower organization which had 2 years to develop its procedures and policies before an agency for mobilizing industrial manpower was created, resulted in a bifurcation of manpower administration which was to continue throughout the war. Chart 21. Military Inductions through Selective Service. agencies in the plants, as well as staff specialist in labor supply,5 provided advice and persuasion on manpower matters, particularly where labor shortages threatened to prevent the plant from meeting delivery schedules. but these agreements tended to give way under the intense pressure of demand for labor. As the pool of unemployed and readily available workers shrank, employers turned increasingly to the United States Employment Service for assistance. This Service, a Nation-wide system of public employment offices operated by the States under Federal grants-in-aid, had in June 1940, some 1,500 full-time and 3,100 part-time offices with more than 18,000 employees. Neither the number of offices nor the number of employees increased appreciably during the defense and war years. The placement work performed by the Service, however, increased greatly. Placements rose from about 41/2 million in the fiscal year 1940 to more than 8 million in the fiscal year 1942. The Service also gave increased attention to developing advance estimates of labor demand and supplies in important industrial areas, and to improving its established procedures for meeting labor shortages in one area by recruiting workers from other areas. The Employment Service remained throughout the war the most important civilian agency concerned with labor supply. The War Manpower Commission in its final form was basically a reconstituted employment service under new top management and with the addition of certain training functions transferred from other agencies. It is therefore important to point out certain disabilities with which the Employment Service entered the war period, and which were never entirely overcome. prevention of hiring discrimination against Negroes and aliens, and provision of uniform safeguards for workers under controlled hiring plans. Second, the Employment Service had developed during a depression period in which its main activity was to register the unemployed and refer them to public works projects. Private employers made little use of the Service during the thirties and tended to regard it as a part of the relief system, and many workers had the same attitude. These community attitudes caused the Service to be held in rather low esteem by many Army, Navy, and Selective Service officials. Efforts by the Employment Service to make itself the focus of labor-supply activities were met by skepticism or even opposition from other Government agencies as well as from industry and labor. The operations of the Service provided considerable ground for such skepticism. Procedures developed to ration scarce jobs among a large number of unemployed registrants were not well adapted to a situation in which jobs exceeded workers. The process of desk interviewing, completing a detailed application, filing the application, then combing the file to fill each employer order was very time-consuming. As the pressure of placement work mounted, the Service did simplify its procedures and eliminate many unnecessary operations. The slowness with which this was done, however, provided some basis for criticism of the Service by other Government agencies. Third, the Employment Service had a serious manpower problem of its own. From 1940 on there was a vast demand for persons skilled in interviewing, testing, hiring, occupational analysis, and other techniques of personnel management. Jobs could be had in private industry, the armed services, and other Federal agencies at salaries much above those paid by most of the States. Many of the most capable and energetic people in the Service left it during 1941 and 1942. While from a broad viewpoint some of this movement may have been in the national interest, it meant that the Service had a very large recruitment and training problem and was constantly being thrown off balance by the loss of key personnel. offices for railroad workers, while responsibility for manning the merchant fleet rested first with the Maritime Commission, and after February 1942, with the War Shipping Administration. Several agencies assisted employers in training workers and supervisors for new wartime tasks. In June 1940 the United States Office of Education initiated a program of vocational education in occupations related to the defense program.8 Local vocational schools, using funds administered by the Office of Education, provided pre-employment courses for unemployed workers and young people, and supplementary training for workers already employed who wished to increase their skill. In August 1940 the Training-Within-Industry Service was established under the NDAC. Its objective was to provide a consulting service to disseminate the best industrial training experience throughout the country. It would not do training itself, but would advise industry on training methods. It early decided to restrict itself to advising on the training of supervisors, who would then be able to train production workers. The Apprentice Training Service of the Department of Labor intensified its efforts to establish apprenticeship programs for the training of skilled workers. The National Youth Administration, the Civilian Conservation Corps, and the Works Progress Administration endeavored to relate their training programs more closely to the needs of defense production. vocational schools and local Employment Service offices on selection of people for job training and their eventual placement in employment; getting agreement between the Civil Service Commission and the Employment Service on recruitment of workers for arsenals and Navy Yards; and securing interagency cooperation on dozens of other specific problems. The actual influence of these committees fell below their objectives. Some increase in interagency cooperation on particular local problems was achieved, and a good deal of useful information was exchanged. But for the most part, each operating agency continued to work along lines which it had already charted. Meetings of the National Committee, which had been fairly frequent at first, had fallen to one per month by September 1941. The lack of concrete accomplishment by the OPM Labor Division was due partly to administrative weaknesses. The Labor Supply Committee was too large and diversified in membership to be more than a debating society, and its members had vested interests in maintaining their respective agencies' control over their present labor supply functions. The Labor Division itself did not have a clear-cut administrative organization, labor supply activities being scattered among at least six separate branches of the Division. The principal operating agency, the United States Employment Service, was blanketed under the top-heavy administrative structure of the Federal Security Agency. The complicated administrative relationships within FSA and between it and the Labor Division involved great delay and endless argument over proper channels of communication and lines of responsibility. Three of the most important agencies concerned with manpower problems--Selective Service, the War Department, and the Navy Department--were entirely beyond the Labor Division's sphere of influence. Within the civilian sphere, its authority over the all-important Federal Security Agency was very nominal. Federal Security, fortified by its technical knowledge and administrative control of employment service operations, was able to resist the intrusion into this field of people whom it regarded as amateurs. Perhaps more important than organizational difficulties, however, was the fact that the problem which the Labor Division was supposed to deal with was still a hear or more in the future. Labor was still in plentiful supply. The Division predicted that serious shortages might develop and urged that precautionary actions be taken. But with millions still unemployed and war not yet certain, these pleas made little impression on production and procurement officials preoccupied with shortages which were already visible. of improving administrative organization in this field and presented several proposals to the OPM Labor Division and the Social Security Board. None of these proposals was acceptable to both agencies, however, and the only concrete development was the appointment on November 29, 1941, of a new full-time director of the Employment Service, John Corson. The outbreak of war had two immediate effects on labor-supply organization: first, steps already noted were taken to bring the state employment services under direct Federal operation; second, several groups proposed the creation of a new manpower agency by Executive order. Federal Security Administrator Paul V. McNutt raised the problem of manpower organization at a cabinet meeting early in December and the President appointed a cabinet committee of three to investigate manpower mobilization in its entirety. The cabinet committee report, largely prepared by the staff of the Social Security Board, was submitted by Mr. McNutt on December 31, 1941. This report proposed the creation of a Manpower Mobilization Board with policy-determining functions, but was rather vague concerning the extent to which this Board would have authority over existing agencies. on the same day the Director of the Budget informed the President that the Bureau of the Budget was interested in manpower administration, and was instructed to proceed with development of the Bureau's proposals. believe in the necessity or wisdom of compulsory controls proposed a manpower board with purely policy-forming functions, with operating responsibility continuing to rest chiefly in the Federal Security Agency. After a month of discussion, a compromise plan was prepared by the Bureau of the Budget for submission to the President. Consolidation of existing agencies within the manpower agency was limited to the Selective Service System, the labor-supply functions of the Labor Division of WPB, and certain statistical functions of the Bureau of Labor Statistics. Other agencies were "to conform to such policies, directives, regulations, and standards as the Administrator may prescribe in the execution of the powers vested in him." The plan was discussed with the President by Mr. McNutt and the Director of the Bureau of the Budget on February 7 and was approved in principle. It was not signed, however, possibly because the President wished to expose it to the criticism of the agencies and private groups on whom its successful operation would depend. In any event, the unsigned order speedily became a center of contention. The heads of agencies which were to lose functions opposed the transfer of any of their operations to the manpower agency. Mr. Hillman and Secretary Perkins, indeed, contended that there was no need for establishment of a new agency. The President's "labor cabinet"11 which was consulted on the matter, drafted a proposal suggesting that manpower organization be placed within the Department of Labor subject to the direction of a policy board consisting of four representatives of labor, four of industry, and one each from the War Department, Navy Department and Selective Service. They also wished a number of labor standards and policies written into the Executive order. allowing Selective Service to retain its independent status. The United States Employment Service also remained in the Federal Security Agency. The labor supply functions of the Labor Division of the War Production Board were transferred to the Manpower Commission, while the training functions of the Division were transferred to the Federal Security Agency. The order creating the War Manpower Commission under the chairmanship of Federal Security Administrator McNutt was signed by the President on April 18.12 This order did not create an operating manpower organization. Such an organization was not wanted by the heads of existing agencies dealing with labor supply, nor did strong support for the idea appear from any other quarter. The President therefore proceeded to place a loose policy canopy over the operating agencies as a possible prelude to outright amalgamation at some later date. The idea of a unified manpower administration, however, was by no means dead. It was revived within 2 or 3 months and made rapid headway during the fall of 1942. A series of Executive orders, culminating in Executive Order No. 9279, December 5, 1942, transformed the War Manpower Commission from a policy forum into an operating agency. For all practical purposes the history of the Commission dates from December 5 rather than from April 18. The new Commission inherited not only most of the WPB Labor Division's personnel and functions but also most of its basic difficulties. Shortages of labor were not yet serious in most parts of the country. While turn-over was rising, most employers continued to feel that they could meet their own labor-recruitment problems and to oppose any suggestion of Government control over hiring. This attitude was shared for the most part by labor leaders, procurement officials, and members of the Congress. While a somewhat vague demand for a manpower program was voiced occasionally in Congress and in the press, specific controls by which such a program might have been effectuated were opposed as an undemocratic interference with the right to work and to hire. There remained also the difficulty of coordinating the activities of powerful operating agencies which had been busy for almost 2 years in building independent organizations and programs. WMC had virtually no voice in procurement policies which determined the size and location of the industrial labor demand or in decisions concerning the number and kinds of men to be withdrawn for military service. The Selective Service System and the labor supply organizations of the War and Navy Departments remained largely autonomous. The inclusion in the WMC staff of many Federal Security officials by no means solved the problem of relationships with that agency. Instead, it precipitated a continuing controversy over whether the WMC should develop a large staff of its own or whether it should remain an appendage of the Federal Security Agency. It seemed self-evident to the FSA group that the Employment Service must become the central operating stem of any manpower agency, but this position was challenged by the newcomers from WPB and elsewhere. This controversy was partly responsible for the failure of WMC to develop a strong field organization during 1942; and without this the essentially local problem of labor supply could not be tackled effectively. The situation was not helped by a complex organization structure which permitted the coexistence of three top officials--a deputy chairman, an executive director, and a director of operations--each of whom had his own sources of strength and each of whom had independent access to the chairman. This arrangement naturally produced frequent controversy over policy and organization, serious diffusion of authority and responsibility, much duplication of effort, and even issuance of conflicting statements and instructions. These circumstances largely explain the ineffectiveness of the Commission during its first 7 months of existence. The various operating agencies continued to function along established lines; but their accomplishments were in no sense accomplishments of the WMC. The United States Employment Service, for example, too additional steps during this period to streamline its operations and give priority in service to war industries, steadily increased its volume of placements, further developed its techniques for expediting interstate movement of labor, attempted to stimulate the transference of draft registrants to war industries, and expanded its lists of essential activities and occupations. These developments, however, were a continuation of trends which had been under way since 1940. Barred from effective action, the Commission turned to introspective discussion of its own organization and functions. Should it continue to function as a policy forum or should it endeavor to absorb the operating agencies and move into the field of action? If the latter course were chosen, should the Commission operate by persuasion and voluntary agreement or should Congress be asked to provide it with compulsory authority through a "national service act"? Much of the time of top WMC officials during the latter part of 1942 was spent in discussing these matters. Until they had been resolved both organizational and program development were bound to mark time. The question of an operating versus a coordinating agency had been thoroughly discussed before the creation of WMC and had been resolved in favor of a coordinating body. This policy was approved at the time by both the Chairman of the Federal Security Agency and the Chairman of the Social Security Board, who were to become Chairman and Executive Director respectively of WMC. By August, however, these officials were of the opinion that the employment service and war training functions of the Federal Security Agency should be transferred outright to the Manpower Commission. This change of opinion was probably due in part to the difficulty which the Federal Security Agency had experienced in getting appropriations for the United States Employment Service.13 Considerations of administrative convenience were also involved. it became increasingly clear that the Employment Service would necessarily be the main operating arm of WMC; possession of mere coordinating authority over the Service made it difficult to secure adjustments in methods and to introduce new personnel into the Service as rapidly as circumstances required. On August 19, the Chairman of the WMC transmitted to the President a proposed Executive order transferring to the War Manpower Commission all employment office and defense training function vested in the Federal Security Agency. The President signed this order on September 17, after some alterations had been made. Agencies transferred outright to the WMC included the Employment Service, the National Youth Administration, the Apprenticeship Training Service, and the Training-Within-Industry Service.14 The order also transferred supervisory authority over the Office from the Federal Security Administrator to the Chairman of the WMC; i.e., from Mr. McNutt on one capacity to Mr. McNutt in another capacity. During August and early September these problem were discussed intensively by the Management-Labor Policy Committee of WMC,16 which had by this time supplanted the Commission itself as the main forum for policy discussions. At the same time, the Committee was clarifying its position on the explosive issue of national service legislation. Since its actions on these two matters were closely linked, it is necessary to review briefly the background of the national service controversy before carrying forward the story of topside manpower policy. both within WMC and in the War and Navy Departments, though there were wide differences of opinion on the details of the legislation. War and Navy officials tended to favor an act similar to the Selective Service Act, which would require registration of all persons within certain age groups and their assignment to essential work through the local Selective Service boards. The bulk of opinion within WMC favored an act similar to the British national service act, which would impose obligations on employers as well as workers and would use the Employment Service as the central administrative agency. In August the Chairman of WMC transmitted recommendations on this subject to the President and was instructed to develop the proposals further in consultation with the Management-Labor Committee. Mr. McNutt then convened the Committee and requested its advice. Discussion soon revealed that both the labor and management members of the Committee were strongly opposed to national service legislation, and this opposition remained unshaken through weeks of subsequent discussion. As an alternative to legislation, the Committee recommended a program which included termination of voluntary enlistments, centralization of military and civilian labor supply functions in a single agency, and formulation of a program for allocating scarce labor supplies on a voluntary basis. The President had take no public position on national service legislation and as late as October 30 told his press conference that no decision had been reached and that studies of the whole situation were continuing. It had become clear, however, that Congress was disinclined to vest compulsory powers in the War Manpower Commission. The opposition of management and labor groups to such proposals had also become increasingly clear. Reports of the WMC Management-Labor Committee's attitude had appeared in the press. On October 30, President Green, of the AFL; President Murray, of the CIO; and Julius Luhrsen, of the Railway Labor Executives Association, took a strong position in opposition to national service. This view was expressed to the President at about the same time in meetings of his "labor cabinet" and discussions with individual labor leaders. Early in November the President informed Chairman McNutt that he had decided not to push for national service legislation. service to the Selective Service System (testimony before the Senate Military Affairs Committee on S. 2805, Oct. 21, 1942). Mr. McNutt appears to have been influenced in this direction by members of his staff who favored national service legislation, and the President seems also to have encouraged him to test public opinion on the subject. With the national service issue out of the way, the President turned to consideration of proposed executive orders on manpower. The order finally issued on December 517 was based on a draft prepared by WMC officials. Among other things it (a) provided for transfer of the Selective Service System to WMC; (b) required the appointment of a Management-Labor Policy Committee of 16 representatives of industrial management, labor, and agriculture, and directed the Chairman to consult with this Committee before taking any action;18 (c) provided for termination of voluntary enlistment; (d) gave WMC control over policies for military training programs carried on in nonmilitary educational institutions; (e) gave WMC authority to regulate all hiring and recruitment of workers in any area designated as critical by the Chairman; (f) required all departments and agencies of the Government to take such action as the Chairman, after consultation with the agency in question, might determine to be necessary to promote compliance with WMC regulations. This last provision was weakened, however, by a qualifying clause--"subject to appeal to the President or to such agent or agency as the President may designate." This order established the War Manpower Commission as an operating agency with a clear mandate to regulate the hiring of labor for civilian work through the Employment Service and to control the recruitment of military manpower through the Selective Service System. It set the stage for more rapid development of field organization and for a complete reorganization of WMC headquarters during December 1942. the order also committed the Administration definitely to a program of mobilizing civilian manpower by voluntary methods rather than through the applications of punitive sanctions authorized by national service legislation. The issue was not, however, finally resolved at this time. It was to recur several times during the next 3 years, and proposals for national service were not finally abandoned until April 1945. More insistent that the problem of labor supply was the problem of preventing strikes and lockouts which would interfere with defense production. 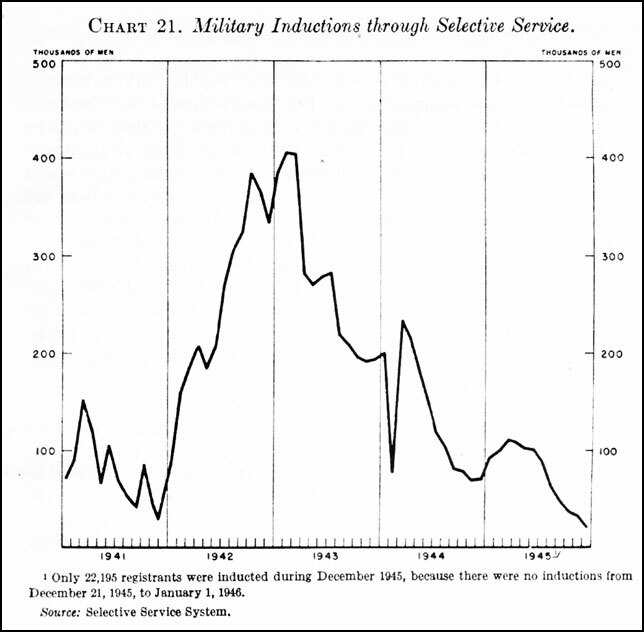 Industrial disputes, which usually increase during periods of rising industrial activity, grew in number during the first winter of the defense program (chart 22). To reinforce the work of existing Federal agencies in this field, the President on March 19, 1941, appointed a National Defense Mediation Board19 consisting of four management, four labor, and three public members. The Board was authorized to further the settlement of disputes by collective bargaining between the parties; if this failed, it might suggest voluntary arbitration; if both methods failed, it was to prepare findings of fact and recommendations, which could be made public. Disputes were to reach the Board only through certification by the Secretary of Labor after the United States Conciliation Service had been unable to settle them. Chart 22. Worker Idleness Due to Strikes. continued to be certified and the Board continued to exist, it remained inactive pending clarification of its status. The outbreak of war made it imperative to revive the Board or to find some alternative method of preventing strikes. 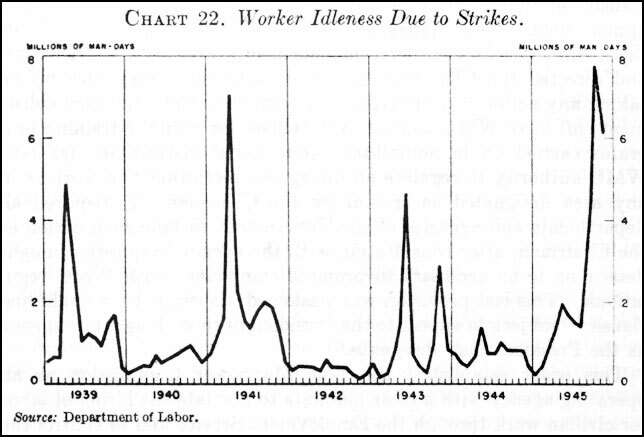 Congressional interest in strike prevention, which had been aroused by the coal mine dispute, grew still stronger after Pearl Harbor, and it appeared likely that drastic antistrike legislation would be passed unless immediate action was taken by the Executive Branch.24 On December 14, the President invited 12 employers and 12 union officials to attend a conference on wartime labor relations, which was to convene in Washington on December 17.25 Chairman Davis of the National Defense Mediation Board was named moderator of the conference and Senator Elbert Thomas, chairman of the Senate Committee on Education and Labor, was made associate moderator. The object of the conference was to secure from the labor and management representatives an agreement that they would not resort to strikes or lock-outs during the war and that they would submit unsettled disputes to a Government agency. It quickly developed that there was general agreement on these objectives. The conference bogged down, however, on the union-shop issue which had wrecked the NDMB. Labor representatives insisted that 4extension of the union shop be recognized as a legitimate union objective in wartime, and that the proposed war labor board have authority to adjudicate union shop demands; their hope was that the Board would grant such demands or at least go some distance in this direction. The employers insisted just as strongly that the union shop should not be made a subject of Government arbitration. They also proposed at first that open- and close-shop arrangements be frozen for the duration of the war, which was the policy followed in World War I. They later modified their proposal, however, to provide that existing union-shop contracts were not to be disturbed and that new union-shop contracts might be arrived at by voluntary negotiations between unions and employers. groups on whom successful operation of [a] tripartite Board would depend. Moreover, if the new Board was to arbitrate union-shop disputes, it might speedily founder on this issue as its predecessor had done. When Mr. Davis advised the President on December 22 that an impassé had been reached, the President instructed him to reconvene the conference at 2 p.m. the following day. During the morning of December 23, the President met with Mr. Davis and Senator Thomas. When the conference met at 2 o'clock, Mr. Davis read to it a letter from the President accepting their "general points of agreement" that there should be no strikes or lock-outs and that a War Labor Board should be created to handle industrial disputes. While there was no direct mention of the union-shop issue, the letter clearly implied that no subject of dispute should be excluded from consideration by the Board. It was thus in effect a decision for the labor position. The employer members of the conference issued a public statement in which, while accepting the decision to create a War Labor Board, the reiterated their view that it should not accept union-shop disputes and reserved the right to argue this point before the Board. full force of the President's war powers was placed behind its decisions. Decisions of the Board could be enforced, and were subsequently enforced in several important cases, through seizure of plants and their operation by the War Department, the Navy Department, or some other Government agency. The Board thus became a regulatory rather than a mediatory body, with authority over wages, hours, conditions, and all the other terms of union agreements. Suspension of strikes meant virtual suspension of collective bargaining for the duration of the war and the substitution of Government decisions for the results of union-employer negotiation. The public members of the Board were faced inescapably with the problem of how far they should compel employers to grant demands which the unions would normally at a time of high employment have been able to win by striking, but which they could not longer win in this way because of the no-strike pledge. The most insistent union demands confronting the Board were for wage increases and the union shop. The reiteration of the same demands and arguments gradually convinced the public members that strictly case-by-case approach was impossible and that guiding principles must be developed on these issues. The basic policies of the Board with respect to wages and union status were hammered out during the first 8 or 9 months of its operation and were not greatly changed in later years. Feeling ran high on both issues, and either could have wrecked the Board by brining about the resignation of the industry or labor members. Only the insight and skill of the public members, and particularly of Chairman Davis, made possible the development of compromises which won acquiescence of not full agreement. The issue of union status was not new to the public members, several of whom had been members of the National Defense Mediation Board. Even had the public members wished to grant labor's demands for a union shop, they were precluded from doing so by the intense opposition of industry to this provision and by the President's statement of November 14, that the Government would not compel workers to join a union. On the other hand, they felt that at a time when Government was preventing the unions from winning their demands by direct action, the unions deserved some protection against possible employer attacks and membership dissatisfaction. but did require people already in the union to remain in it for the duration of the union contract as a condition of employment. As a result of criticism by industry members of the Board, the clause was shortly amended to include an "escape period." This permitted any union member to resign from the union within a stated period--usually 15 days--after a Board decision ordering maintenance of membership. The industry members regularly dissented from all Board orders on this subject, but their dissent was considerably less vehement after the escape provision was added. In the field of union security the Board was free to work out its own compromises. 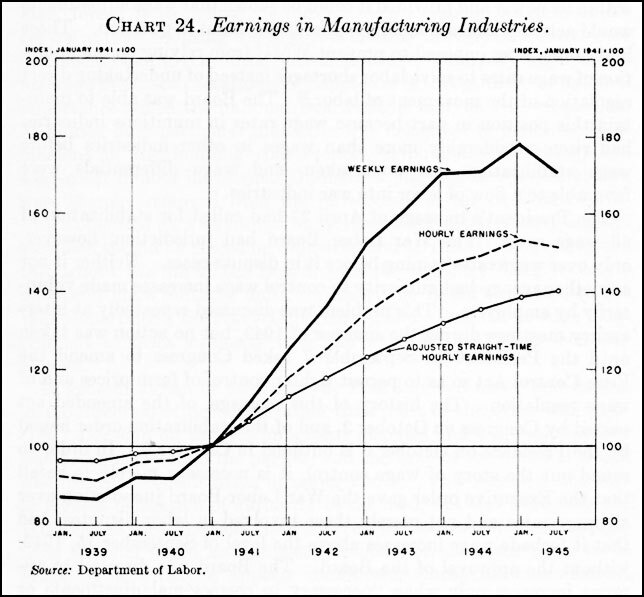 Regarding wages, however, it was obliged to work within the confines of the national price stabilization policy.l Moreover, because of continued increases in the cost of living, the Board remained throughout the war under almost continuous labor pressure to permit increases in wage rates. In spite of recurring wage crises, however, and in spite of numerous concessions to the labor viewpoint, the basic principles of wage adjustment worked out during the summer and fall of 1942 remained as the general framework of Board policy until the end. It shall be the policy of those departments and agencies of the Government dealing with wages . . . within the limits of their authority and jurisdiction, to work toward a stabilization of prices, fair and equitable wages, and cost of production. The War Labor Board thus entered on its work without any clear instructions on wage policy from Congress or the President. Frequent discussions of this subject by the Board during February and March revealed much disagreement and uncertainty. The industry members favored immediate establishment of a general wage policy directed toward stabilizing wage rates at the level of January 1, 1942, with exceptions only to correct substantial wage disparities in an industry or to relive actual hardship. The labor members, sensing that any general wage policy would tend in the direction of a wage "freeze," opposed establishment of a general policy and argued for continuation of the case-by-base approach used by the NDMB. Mr. Henderson on several occasions urged the Board to adopt a firm wage control policy in order to make price control effective. Since OPA had not yet established any direct control over the cost of living, and since the Board had no instructions on wages from the President, the public members did not feel able to override labor's objections to wage control. The Board therefore continued for several months longer to operate on a case-by-case basis, and the general level of wages continued to rise at an accelerating rate. The strategic position of the public members was improved by the President's seven point anti-inflation program submitted to Congress on April 27, 1942, and by the almost simultaneous announcement by OPA of a general maximum price regulation designed to freeze retail prices at March 1942 levels. The public members were now able to argue convincingly that, if retail prices were effectively stabilized, wage increases would no longer be necessary to protect the workers' standard of living, and also that unless wage increases were controlled the price stabilization program could not succeed. They had also the support of a statement by the President in the anti-inflation message that "we must stabilize the remuneration received by individuals for their work. . . . I believe that stabilizing the cost of living will mean that wages in general can and should be kept at existing scales." the Board. In these discussions were developed the criteria which the Board was later to use in passing on wage increases and which were eventually formalized in Executive orders. percent or more and that it would be inequitable not to allow as much to the steelworkers. This decision was rapidly generalized into the so-called Little Steel formula, under which any group of workers whose straight-time hourly earnings had increased by less than 15 percent since January 1, 1941, was entitled to increases sufficient to bring them up to this level. Nothing was said at this time as to whether the wage formula would be adjusted upward if the cost of living continued to rise. The opinion in the Little Steel case, however, and other statements of the public members implied that it would not be altered. Inn spite of intense labor pressure on several occasions, the Little Steel formula did remain unchanged and constituted the cardinal point of WLB wage policy until the end of the war. The story of wage stabilization from early 1943 until the end of the war is essentially the story of how the public members of the Board, the directors of OES and OWMR, and the President himself, conducted an elastic defense of the Little Steel formula. Onslaughts on the formula were countered by (1) intensified efforts to stabilize or reduce the cost of living. The extension of dollar-and-cents price ceilings and the attempted roll-back of food prices in April-May 1943 were directly related to AFL and CIO demands for abandonment of the Little Steel formula. After the National War Labor Board had formally voted down such a demand on March 22, the President's "labor cabinet" met with him on April 1 and told him they were not renewing their request for wage increases but were asking instead for reductions in food prices to the level of September 1,5 1942. Immediately following this conference, the OPA programs just mentioned were inaugurated. (2) Increasing worker's take-home pay without increasing basic wage rates through fairly generous grants of incentive wage systems, night-shift differentials, paid holidays, vacations with pay, and other "fringe" wage demands. Members of the Administration whose primary concern was with price stabilization tended to feel that the Board went too far in this direction and attempted to limit its discretion. The public members of the Board felt that they had to go some distance to maintain labor support of the Board, and insisted that they be given considerable latitude. On the whole, the public members were fairly successful in walking a tightrope between OPA and OES on one side and the labor organizations on the other; and labor discontent was held within limits without disrupting price ceilings. (3) Liberalizing other parts of the Board's wage policy such as the policy toward substandard wage rates. Such changes permitted large groups of workers to obtain general wage increases without any alteration of the Little Steel formula. worked out during this formative period. Even though a group of workers had received a 15 percent increase since January 1941, they might receive a further increase if their wage rates were "substandard," i.e., inadequate to support a minimum level of decent living. This was accepted by the public members from the beginning as a valid basis for wage increases. The first major application of the principle was in the granting of a general increase of 71/2 cents per hour to the cotton textile workers. It was also laid down at an early point that wage increases might be necessary to correct "inequalities" or "inequities", i.e., wage rates seriously out of line with rates paid by other plants for similar work, or rates for one job in a plant which were out of line with other rates in the same plant. This principle, however, remained rather unclear for some time. It was not at all certain in the summer of 1942, for example, whether it was inequities within an industry or an area which were to be eliminated, nor was it clear how much levelling-up of rates was required to eliminate an inequity. Chart 24. Earnings in Manufacturing Industries. WPB, and the procurement agencies. The Board adopted an increasingly cautious attitude toward such proposals as their potentialities became apparent. Policy on this subject was clarified relatively late--October and November 1942--and included two points: first, as a general rule the Board would not adjust wage rates to influence the flow of labor; second, it would consider action in critical situations provided the War Manpower Commission had taken all actions within its power and provided it could be shown that wage adjustments would actually increase labor supplies in the plant in question. 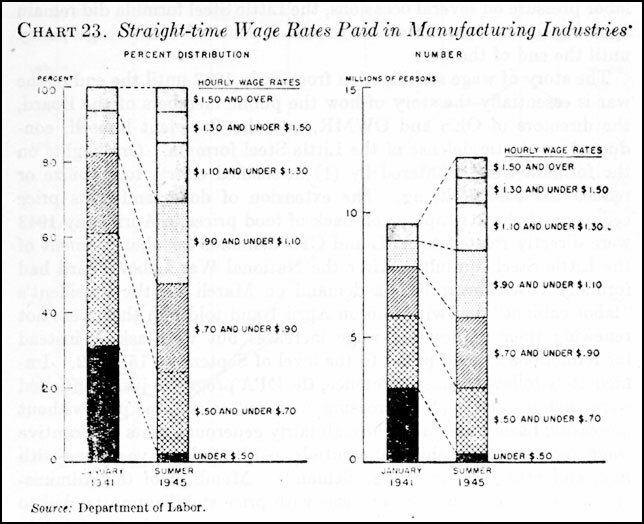 These limitations were imposed to prevent WMC from relying on manipulation of wage rates to solve labor shortages instead of undertaking direct regulation of the movement of labor.28 The Board was able to maintain this position in part because wage rates in munitions industries had risen considerably more than wages in other industries before wage stabilization was undertaken, and wage differentials were favorable to a flow of labor into war industries. in previous months. On November 6, the Board, in outlining its detailed procedures for wage regulation, took occasion to restate and elaborate these four principles.29 They were to remain central to Board policy for the next 3 years, and argument was to center mainly about detailed modification and reinterpretation of them. industry or region to the next, and a rather lengthy appeal procedure from local panel to regional board to national appeals committee to national Board, with occasional ricochetting of cases back and forth between these levels. By the end of 1942, the, the Board had surmounted the initial crises over union security and wage policy, won substantial acceptance from labor and management, worked out a modus vivendi with other Government agencies in bordering fields, received an extension of its jurisdiction to cover all wage rates, developed the broad outlines of its wage strategy, and shaken down its administrative organization into semifinal form. The only subsequent events requiring consideration in this history were the occasional crises in wage policy alluded to above. 1. Social Security Board. Bureau of Employment Security. Estimates of Manpower Requirements to December 1943, June 12, 1942. Chart. 2. This estimate proved to be reasonably accurate as regards the total; the number actually employed and in the services in December 1943, was 61.3 million. As would be expected, there were errors in the components of the total; employment in manufacturing, for example, was overestimated by about 2 million, while the number who would be in the services was underestimated by 1.3 million. These errors, however, came close to canceling out. 4. From October 1940, through January 1943, the Selective Service System furnished men only to the Army, while the Navy secured all of its personnel through voluntary enlistment. After the termination of voluntary enlistment pursuant to Executive Order No. 9279, Dec. 5, 1942 (7 Federal Register 10177) the System furnished men to the Navy as well. 5. In the Army, these were field representatives of the Labor Branch of the Industrial Personnel Division of the Army Service Forces; in the Navy this work was centered in the Shore Establishment's Civilian Personnel Division (transferred in February 1944 to the Office of Procurement and Material). 6. The quit rate per hundred employees in manufacturing was 0.66 in January 1940; 1.31 in January 1941; 2.36 in January 1942, and 4.45 in January 1943--approximately a geometric rate of increase. Separations for other reasons remained substantially stable at about 2.7 throughout this period. 7. Before this time the Social Security Board, through its control of grants-in-aid, was ab le to prescribe minimum standards of fiscal and personnel administration for the State services. It also provided technical advice and assistance on operating problems, but had no direct control over operations. On Dec. 19, 1941, the President requested each of the Governors to lend the facilities of the State employment service to the Federal Government for the duration of the war. The Governors consented, though in a few cases somewhat reluctantly. The Director of the United States Employment Service in the Social Security Board thus acquired direct authority over the State employment service directors, which was exercised through representatives in the regional offices of the Board. 8. This was financed by an initial appropriation of 15 million dollars in the Second Deficiency Appropriation Act 1940. (54 Stat. 628). 10. OPM Labor Division, Labor Supply Branch: Circulars No. 1, July 1, 1941; No. 2, July 9, 1941; and No. 3, July 9, 1941. 11. Composed of three AFL and three CIO representatives. 12. Executive Order No. 9139, Apr. 18, 1942, 7 Federal Register 2919. 13. The State unemployment compensation directors had long suspected the Social Security Board of intent to federalize both employment service and unemployment compensation operations, and were determined to prevent it from retaining control of the State employment services after the war. When the Board came to Congress for an appropriation for employment service operations during the fiscal year 1943, the State directors succeeded in writing into the bill a specific statement that the State Services must be returned after the war, and a further provision that the salaries of employment service workers could not be raised above the level prevailing for State employees in the respective States. Employment Service workers were thus materially worse off as a result of federalization. They were now subject to the 48-hour Federal workweek and a 5 percent retirement deduction, while their basic salaries remained unchanged. The Service continued to be an easy recruiting ground for more highly paid jobs in industry and in other Federal agencies. Between January and June 1942 some States lost more than a third of their personnel, including many key officials. 14. Executive Order No. 9247, Sept. 17, 1942, 7 Federal Register 7379. 15. For example, S. 2805, introduced by Senator Austin on Sept. 25, 1942. This bill would have empowered local Selective Service boards to assign to production work any man between the ages of 18 and 65, subject to the established appeals machinery of the Selective Service System. Several other bills to the same general effect were introduced in the House and Senate during 1942 and 1943. 16. This Committee,, appointed by the Chairman in June 1942, consisted of four management and four labor members, presided over by the Deputy Chairman of the WMC. The Committee contained several very able individuals, and its members were both closer to and more directly concerned with matters of labor supply than the Commission members. Thus while it had been originally conceived as a purely consultative body, it soon proceeded on its own motion to discuss in detail all important actions proposed b y the WMC staff and also to propose manpower programs of its own. 17. Executive Order No. 9279, Dec. 5, 1942, 7 Federal Register 10177. 18. The first Executive order made no mention of such a committee. The existing committee was appointed by the chairman on his own motion in June 1942. As a matter of practice, the committee had been consulted on all important actions since that date; and had itself taken the initiative on more than one occasion. During the controversy over national service legislation, however, the committee was told at one point that it had no legal standing and that consultation with it was merely a matter of courtesy on the part of the chairman. The labor members were particularly piqued by this and demanded that the chairman write the committee into the new Executive order, which he agreed to do. 19. Executive Order No. 8716, Mar. 19, 1941, 6 Federal Register 1532-33. 20. In the North American Aviation case, the union called a strike during mediation in violation of an agreement with the Board. In the Federal Shipbuilding case, the employer refused to accept a recommendation for inclusion of a maintenance of membership clause in the contract. In the Air Associates case, the employer refused to accept a recommendation that striking employees be returned to work without discrimination. The President by Executive order directed the Navy to take possession of the Federal Shipbuilding yards, while the other two plants were placed under Army control. 21. Case No. 20 B. Hearings, Sept. 17-19, 24-25, Oct. 7-9, Oct. 31-Nov. 10. Final recommendations of the Board issued Nov. 10. Strikes Sept. 15-22, Oct. 27-Nov. 3, Nov. 17-24, 1941. 22. Department of Labor. Bureau of Labor Statistics. Bulletin No. 714, Report on the Work of the National Defense Mediation Board, Mar. 19, 1941-Jan. 12, 1942. Opinion of Chairman W.H. Davis, in National Defense Mediation Board Base No. 20 B, Nov. 10, 1941, pp. 122-126. 23. The text of the President's statement appears in Bureau of Labor Statistics Bulletin No. 714, Report on the Work of the National Defense Mediation Board, Mar. 19, 1941-Jan. 12, 1942. This report also contains the other documents pertinent to this case. After another strike in protest against the Board's decision, the union on Nov. 22, accepted the President's proposal that a three man arbitration board be appointed to adjudicate the dispute. This board, consisting of John Steelman, John L. Lewis, and Benjamin Fairless, on Dec. 7 issued a 2 to 1 decision in favor of a union-shop clause. 24. On Dec. 3, the House by a vote of 252 to 136 passed H.R. 6066, introduced by Representative Smith of Virginia. This bill provided for a 60-day notice for the calling of a strike, a secret strike ballot under Government supervision and calling of a strike only after a majority vote, freezing of open and closed-shop arrangements for the duration, severe restrictions on picketing, prohibition of jurisdictional and sympathy strikes and of all boycotts, registration and filing of financial reports by all unions, and numerous other controls over union activities. The bill went to the Senate Committee on Education and Labor, which had this and several similar measures under consideration at the time of Pearl Harbor. 25. Six of the labor officials were nominated by the AFL and six by the CIO. The employers were chosen in consultation with the chairman of the Advisory Council of the Department of Commerce. 26. Executive Order No. 9017, Jan. 12, 1942, 7 Federal Register 237. The Board was to consist of four industry, four labor, and four public members. The Board was authorized to take jurisdiction of a dispute after a certification by the Secretary of Labor that the Conciliation Service had been unable to settle it or, after consultation with the Secretary, the Board might take jurisdiction on its own motion. All employees, records, and funds of the National Defense Mediation Board were transferred to the NWLB, and W.H. Davis, who was chairman of the NDMB for the last 6 months of its life, became chairman of the NWLB. 27. It should be understood that maintenance of membership was ordered only where an open shop had previously prevailed and the union was demanding a union shop. Where a union shop had previously been effect, the Board would not order any weakening of the union shop in a new contract. So numerous were Board orders on maintenance of membership, however, that a survey of union agreements in the summer of 1945 indicated that maintenance of membership clauses, almost unknown before the war, were actually more frequent than union-shop clauses. 28. The first important action taken on this ground was the granting on Oct. 16 of a $1-a-day increase to nonferrous metal miners in the mountain States, where critical shortages of miners existed. This action was taken, however, only after the War Manpower Commission had issued an order "freezing" nonferrous metal workers in their jobs. It was in connection with this case that the Board enunciated its policy of acting on manpower problems only in support of action taken by the agencies directly concerned. 29. NWLB Press Release B-284, Nov. 6, 1942. 30. The main steps by which this decentralization program was accomplished are described in the following NWLB orders and releases: General Order 14 (7 Federal Register 10204), 17 (7 Federal Register 10204), 18 (7 Federal Register 10204), 19 (7 Federal Register 10518), 20 (7 Federal Register 10519), 21 (7 Federal Register 10519), 24 (7 Federal Register 11109), 25 (7 Federal Register 11109), and 13-A (7 Federal Register 10770); also Press Releases B-273, B-309, B-312, B-350, B-357, B-360, B-394, B-396, and B-423.